NACOGDOCHES, TEXAS - Do you know what the Texas horned lizard, Western diamondback rattlesnake and Lucifer hummingbird have in common? Through the Texas Parks and Wildlife Department's Conservation License Plate program, images of these iconic, native wildlife species are featured on many Texan's license plates and signify a concerted effort to better understand and conserve the state's natural resources. 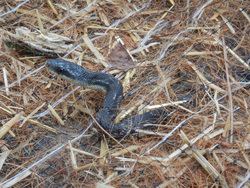 This year, Dr. Christopher Schalk, assistant professor of forest wildlife management at Stephen F. Austin State University's Arthur Temple College of Forestry and Agriculture, and Dr. Daniel Saenz, research biologist with the U.S. Forest Service, received one of these highly sought-after grants and are currently investigating the effect of erosion control materials on snakes. Layers of woven mesh mats made of varying materials are often used as erosion control devices during construction along Texas' roadways, but little is known about their impact on wildlife species susceptible to entanglement in the mats. "A lot of the documented deaths have been anecdotal observations," Schalk said. "No one has done consistent surveys or entanglement trials to determine which products are more dangerous to snakes." Prior to launching their research, U.S. Forest Service field technicians surveyed locations in Houston County where erosion barriers were utilized. "We found 10 snakes of four different species entangled, and seven were dead," Schalk said. "The thing is, it was not that large of an area where these barriers were deployed." The scale of potential snake mortality becomes quite clear when one considers the miles of erosion control mats used alongside road construction throughout Texas and the United States, including areas adjacent to habitat of federally threatened species, such as the Louisiana pine snake. "The troubling thing that we're finding is that larger snakes, which are the adults, are more prone to getting entangled," Schalk said. "That's not a good thing for their population viability." During the field surveys, technicians found two gravid females, each containing more than 20 eggs, that had become entangled and died in the mesh netting. "It's a really a brutal death and a sad thing to see," Saenz said. To shed light on which style of erosion control netting is least likely to entangle snakes, Schalk and Saenz are conducting field trials with three commonly used erosion control mats. The team places a captured snake in an enclosure with one style of erosion control mat covering a portion of the area. The snake is then observed as it traverses the material for up to three minutes. If the snake becomes entangled, it is documented and immediately removed. Schalk said that so far it appears the erosion control mat constructed of woven natural fibers appears to be the least likely to cause ensnarement, but data analysis is necessary to confirm this observation. "Unlike the polypropylene mesh mats, the corners of the woven coconut fiber mats are not fixed," Schalk said. "This provides a lot more flexibility in terms of animals passing through." Ultimately, the researchers hope to share their findings with the Texas Department of Transportation, the state agency responsible for numerous large and complex transportation projects that require the use of erosion control mats. "A TPWD Conservation License Plate Grant enables us to conduct proactive research that helps identify the potential factors that may threaten a wildlife population," Schalk said. "Results from this research can help develop strategies to help conserve Texas wildlife." To learn more about how you can support wildlife conservation and research like this, visit the Texas Conservation License Plate Program at conservationplate.org.